Sandy and her cute baby boy, Louis, were spotted out & about in New Orleans on Mothers Day, May 9! And don’t forget to keep voting for Sandy on the 2010 MTV Movie Awards! I’m so happy to inform that Sandy has been nominated in three categories in the 2010 MTV Movie Awards. Vote for her on the links below! I’m so happy to be able to wish you an incridible Mothers Day this year. 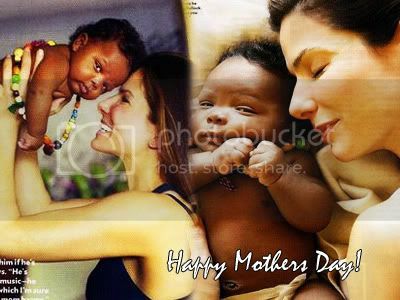 I hope you have an amazing day with your baby boy and your family and enjoy every moment of being a mother. I wish you and Louis an incredible life together and I know he will bring you all the joy and happiness you deserve and you’ll be such an incredible mother to him. Have an amazing day! We’ll alaways be here for you both. We love you. Also, Happy Mothers Day to all the mothers in the world! I hope you all have a very nice day! Bullock, 45, has remained out of public view since introducing Louis to the world and revealing she had filed for divorce from husband Jesse James, 41, in the wake of the scandal caused by his infidelities. She brought the newborn home in January, four years after she and James began the adoption process, and will raise him as a single mom. I’m sorry guys, but we were contacted by People Magazine and they asked to remove the scans from the magazine. So we had to do that but I’m sure you all will get your copy and read the amazing interview that Sandy gave to the magazine! More news of Sandra Bullock’s baby, Louis. I just found few more information about the interview she gave. Sunny made that necklace for him… to represent all the kids. I want him to know no limits on where he can go. I want him to experience all culture, nationalities, countries and people like I did. I want his mind to be open and free. We were raised that we are all the same. No one greater, smarter, more powerful. We are all equal. I would love for Louis to know that . He has a big, beautiful, diverse family. As long as he know he is loved and protected and given the opportunity to touch and see everything, then I will have done my job as a mama. The photo shocked me and made me sad. This is not the man I married. This was stupid, this was ignorant. racism, anti-Semitism, sexism, homophobia, anything Nazi and a boatload of other things have no place in my life. And the man I married felt the same. This I hope Jesse will address one day, but that is not the world I live in or have ever lived in and have any tolerance for. A friend of ours helped arrange for a bris [Jewish circumcision ceremony] at the house, because we couldn’t go [to a hospital for the procedure]. The mohel [a person trained in the practice] came to us. You have never seen adults more panicked about what was about to happen to their son, but the celebration and the amount of love we felt and the pride in the little man whom we love so, so much became the greatest moment I have ever had in my life. Meet Sandra Bullock’s Baby Boy! According to the new issue of People Magazine, Sandra Bullock is now a proud mom of a little baby boy, Louis Bardo Bullock. Congratulations, Sandy. I’m so happy for you! Also, I’ve added outtakes from the same photoshoot. Enjoy! Added few outtakes from photoshoots photographed by Kirk McKoy and Andre Eccles. Enjoy!